March 5th, 2006: Warm, but cloudy and still. Barely under freezing. There is at least six inches of new snow on the ground and it had a crust on it, so we must have had some rain overnight. I scraped the snow off the porch roof and garage roof with my roof rake; of course, that left a bank about three feet high right in front of the garage door. No problem - I’ll just start up the snowblower and blow it away. The snowblower started fine, but it wouldn’t throw any snow. After dithering around for a couple of hours, sure that something major had broken, I tightened up the impeller belt and it worked just fine. We have to go to hospital in Melfort first thing in the morning, so I had to clear the driveways instead of waiting for the grader to go by as I usually do. Two passes in the driveway and the motor quit. I tried the car to see if we really had to blow the driveway, but the car wouldn’t move. Finally, I got smart. I dragged the blower into the garage, and phoned Mel Tkachuk to come and push out the driveway with his quad. We went to Tisdale for the Parkland Photography Club meeting on Tuesday. The news was full of weather advisories and we almost cancelled, but it looked so clear we decided to go. It was still not snowing or blowing when we came home that evening. Next morning, though, there were four or five inches of new snow on the ground and stories of horrendous driving conditions. I did slog over to the Cove for coffee, but it was tough going. Another workout for the snow blower! It seems to me it never did quit snowing completely after that, even when the sun shone. I should have blown the driveway again on Friday but didn’t have the energy. It’s just as well, too, because it started snowing hard late Saturday afternoon. That made it worth while to start up the blower again. One-Way Derek bought a new snow machine recently. Its manufacturer advertised it as a family affair – the husband drives the snowmobile and the wife brings along the half-ton to bring it home when it quits. Derek went for a ride but without his wife and half-ton; he had to phone for a ride home. Now he is trying to dream up some way of towing the half-ton behind so he doesn’t get left on the trail again - not that it matters because he hasn’t been able to get the machine running again! All my information came from Jack so it should be reliable and unbiased. News flash! Derek made it to the Cove on Wednesday on his snowmobile, though I understand he needed help to get it started. I will try to find out if it took him home again and let you know. A group from Kindersley area came up for a week of snowmobiling and our son-in-law, Brian Grimson, rode with them for a couple of days. Over southeast of Porcupine Plain, one of the machines hit a deer. The driver wound up in hospital with broken ribs; both the snowmobile and the deer were demolished. The group managed to get the injured man out to a road, then Stan Tvait came to their rescue and took him to hospital in Porcupine Plain. Many thanks to Stan! Last report on the injured man is that he may be allowed to leave hospital this weekend; his wife was going to come and get him. That ride back to Kindersley isn’t going to be a lot of fun. The rest of them stayed until Thursday. One of them, Kelly Close, dropped around to our place Thursday evening and I asked how their day’s snowmobiling went. He said: “Awesome! Several inches of powder all day!” Greenwater is going to get some pretty good advertising from the Kindersley area! One of the owners of the Cove, Jerry Morrie, has been spending a lot of time here learning the business and the community. 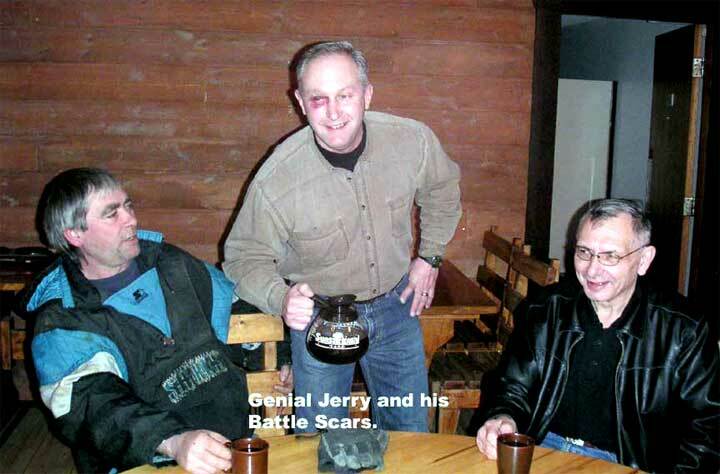 Last Tuesday, he was pouring coffee and sporting a dilly of a shiner. At first he tried to tell us he was maintaining order in the Cove, but we found out later that he was playing hockey in Kelvington and caught a puck in the eye. That’s a good way to get into the community - now he’s known far and wide as the guy from the Cove with the black eye!